The phone rang. It was the Editor. And then she rang off. I knew nothing of the Gota, nor of the Wilhelm Tham which, so it appeared, carries passengers along it. But a few minutes of Googling revealed why this trip had been so graciously offered to me. The Editor, you see, rarely travels with anything less than a steamer trunk. Being the elegant sort, she is accustomed to staterooms measured in acres with baths like swimming pools and beds you can sleep in sideways. But on Wilhelm Tham, I noted glumly, the cabins are the size of “a small sleeping compartment on a train”. With bunks. The shower is along the deck, as is the loo. I knew at once that I would hate it. 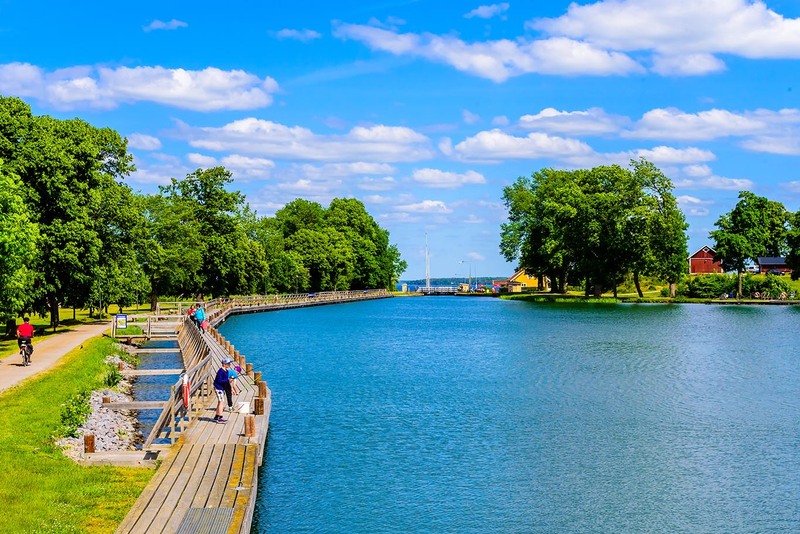 A week or so later I found myself in the pretty Swedish town of Mariestad. And there, bobbing on Lake Vanern, sat the handsomest, trimmest little vessel you could ever hope to see. With two veranda decks, an elegant counterstern and a stubby little funnel, it looked less like a ship than like a time-traveller from a more elegant age. Built in 1912, the 268-ton Wilhelm Tham is named after a former managing director of Husqvarna, then a major armaments manufacturer, now better known for its lawn mowers. Just 32 metres long, the boat accommodates 50 passengers on three decks, with 25 cabins, a dining room and a small lounge/library. Our cabin was on Bridge Deck, and I was prepared for it to be small. It was – but it was also quite beautiful, a jewel-box of mahogany and brass. Would my pot belly squeeze in? It did! With so little room for manoeuvre, my partner and I found that couples must dress or undress in turn, one waiting out on deck. And with so little storage space, we were glad we’d travelled light (if it won’t go in your airline hand luggage, it won’t go in your cabin). Between the six cabins on Bridge Deck there is one loo and one shower, both kept spotless by the crew. My customary nocturnal visit involved an enjoyable breath of fresh air, but we were lucky with the weather. I wouldn’t like to try it in horizontal rain. The dining room, with picture windows on three sides, is both cosy and pretty. And since there is nothing here so antisocial as tables for two, you have to chat to your fellow travellers, most of whom are Swedes. But seating is thoughtfully assigned and, as the only Brits on board, we shared a table for four with a Swedish couple whose command of English exceeded ours. The food proved excellent if you’re happy to eat what you’re given (the galley is too small to offer a choice, though dietary requirements can be catered for). With two generous courses at lunch and three at dinner, we enjoyed dishes as diverse as Arctic char with roasted almond potatoes, salted slow-cooked brisket of beef with baked root vegetables, and rhubarb pie. All with a Swedish flavour and all cooked to perfection. Drinks are extra and are expensive, simply because Sweden is expensive. Our modest intake of three glasses of wine and two beers over a three-day cruise came to £50, though tea and coffee are included, and are available all day. 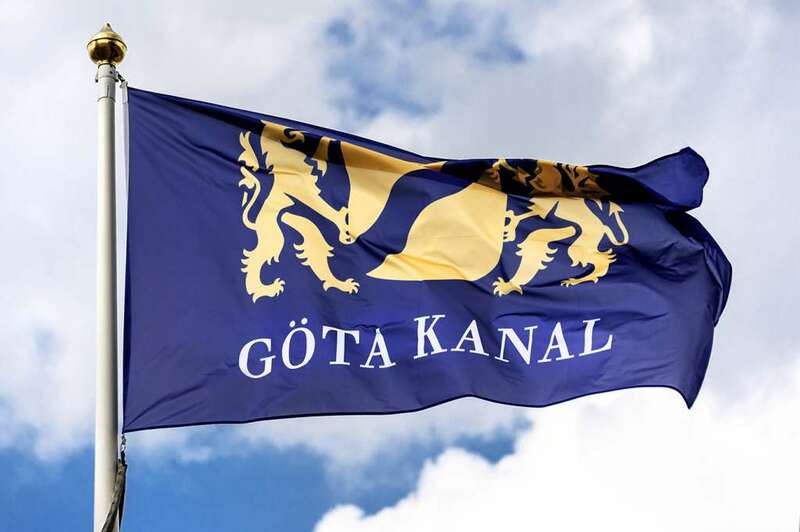 But what of the Gota Canal? Crossing Sweden from west to east, via Lakes Vanern and Vattern, its original purpose was to bypass Danish waters and so avoid the payment of duty on goods. Opened in 1832 after more than two decades of digging, it is an engineering marvel. 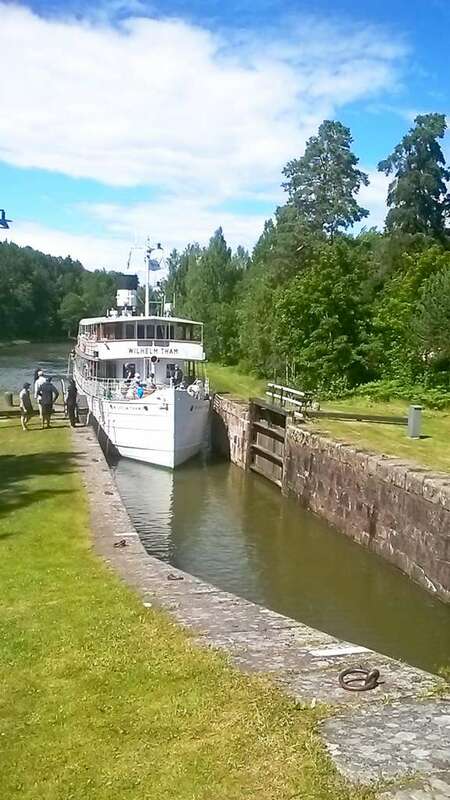 Especially for its flights of locks such as the Carl Johan “staircase” at Berg (everyone disembarked to watch Wilhelm Tham’s gentle descent, via no fewer than seven sets of gates, to Lake Roxen). Unlike British canals, threading their way through decayed industrial heartlands, the Gota meanders among forests of birch, willow and oak, and sometimes along the sides of broad valleys. Here, to misquote Tennyson, “On either side of the canal lie/Long fields of barley and of rye” (and of wheat, lavender and potatoes). In fine weather the water lies still, perfectly reflecting the overhanging trees. I have been on many cruises and I cannot think of any that induced such tranquillity as we found simply by sitting in a comfortable chair on the sun deck of Wilhelm Tham, watching Sweden drift slowly by. If the need for activity struck, that too was available. At certain locks we were invited to disembark and stroll or cycle (bikes supplied) along a wildflower-edged towpath to the next lock, a mile or two away, there to re-embark in time for tea. Each night we moored, usually near some small town, and in Sweden’s late evening light it was pleasant to ramble along winding lanes with only each other and darting bats for company. After three days’ serene progress, the Wilhelm Tham arrived at Norsholm where we disembarked for our coach transfer to Stockholm and our flight home. So what did we think? Well, the ship is an antique, the accommodation is cramped, and with stairways more like ladders it is not for those with limited mobility. Nor will it please those who like to be constantly entertained. But British passengers are almost unknown, so if you want to get one up on your cruising chums, this is the way to do it. And if you have an enquiring mind, a measure of self sufficiency, a love of nature and an appreciation of the ingenious works of man, you’ll absolutely love it. We did.